Best 2 Person Hot Tub (Reviews 2019) - What do I do in the winter? Battery Asking » Backyard » Best 2 Person Hot Tub (Reviews 2019) – What do I do in the winter? After a busy day in your daily endeavors, the best way to unwind and relax would be to soak in a hot tub and just let go of your day and enjoy the moment. Hot tub water is hydrotherapy to pain and muscles relief, eliminating stress and inducing sleep. Again, a hot tub is a place for socializing as practiced in the ancient days among the Romans. If then you have a 2-person hot tub, it would be an ideal place to socialize with your spouse, your family member or even your friend. There are various types of hot tubs with different designs that can create confusion when searching for the best 2-person hot tub. But, that won’t be a problem when you have this review which makes your selection easy. Also, there are some guidelines with factors to consider when buying a 2-person hot tub. Lastly you will get more insights from FAQs (frequent asked questions) with their answers. First, have a peek of what we shall be reviewing in the summary table. Thereafter you will get all the informational details of each product. You may preview the product by clicking the name. Q: What is the best safe temperature to use in a hot tub? Q: For an outdoor hot tub, what do I do with it in the winter? Q: Is it alright to leave hot tub empty during winter? Q: What temperature should my hot tub have when not in use? If you intend to get an easy to set hot tub which you can set it up in 20 minutes and have it running, then Comfort Line Products spa should be your choice. It is portable, and you can set it up anywhere you choose so long as there is a grounded power connection of 110V. You can set it outside on your yard in the summer and move it indoors in the winter to have maximum use of it at all time. With Comfort Line spa you will get that enjoyable and relaxing moment you have all along been looking forward to having. No more muscles aches and tiredness after your long day of activities. You will get an unforgettable experience from 100-micro air jet and Turbowave massage system. It has an adjustable thermostat heater of 1000W that can go up to 104 degrees to provide you with the right controlled temperature for your full comfort in the water. If you have chronic back pain, this hydrotherapy would be the best solution. If you are in the ‘empty nest’ age, there would be no better way of keeping on bonding and give each other company than in this style. The Spa-N-A-Box is made of a 3-ply PVC vinyl of heavy duty marine grade for durability. There are no barriers on its padded floor which makes it ideal for water aerobics and other water fun. Therefore it will not limit you to where you would like to sit or your movement. SaluSpa Siena is fast and easy to set it up without using tool or expertise. Using a spa’s pump, you inflate it for immediate use. For an affordable hot tub and an economical to use one, SaluSpa Siena is what you should have. Whether you will place it on a wooden deck or the ground, the experience of comfort will beat all the other shortcomings of the day. It goes up to 104 degrees F for that right temperature to soothe your sore muscles and by using the massage jets. You can also enjoy your evenings with a loved one or whichever time of the day you may choose to relax. The air-filled walls of the hot tub are made using Tritech material (a reinforced polyester mesh core material with two PVC encasements) for ultimate strength, durability, and comfort. Not forgetting the 120 air jets that surround the hot tub for the unique massage experience. A plus for this hot tub is the two handles which will assist you to get into it and exit for maximum safety to the user. SaluSpa Siena comes with inflatable and insulated top cover, a mini table for beverages, a DVD for set-up instructions and maintenance guide, a pressure gauge, a chemical floater and filter cartridges. It also has a time that starts and stops automatically. Gemini Plug and Play hot tub shell is made of Lucite-Extra Acrylic and strengthened with 3 Dura-Bond layer shell to boost its strength and durability. It has eight spa jets strategically placed which will restore strength to the tired neck and shoulder muscles. It has two heating systems which are water heating system through a frictional pump and heat recovery. It recycles heat by Green method which uses an energy recovery system through Econo-Boost to recover pump and motor generated heat to warm water. Therefore the heating system of QCA hot tub will require less energy and thus save on power consumption. The hot tub measures 7.5’ long x 3.5’ wide x 2.4’ deep the right size for that fits 2 people comfortably. The 15’ GFCI protected power cable that comes with the hot tub plugs to 120V/15A, and also it has no complication in filling it up with water, you can use a garden hose which is easy to do it. The American Spas which has a unique design of triangular shape is a 2-person hot tub but with enough room to fit both parties comfortably. This hot tub which brings together a unique and classic design with cutting-edge technology and affordability adds serenity to your patio or backyard. It has 28 jet spas carefully designed with stainless steel to provide maximum sturdiness and durability. The jet spas will provide hydrotherapy to your sore muscles. The cabinet panels of this hot tub are uniquely designed with fiberglass to add insulation and durability. Far from that, it combines elegance and beauty to your unit. Its triangular shape is a unique one and can fit at any corner when placing it on your patio. Above all, it has a built-in Ozonator to keep your water sanitized all through. Also, it has an individual on and off flow controls, and directional controls on specific water flow pressure to direct the massaging water to the exact sore muscles and any other area of your choice. The LED lighting is another intriguing feature that changes the serenity of your backyard. Using reflection of a cascading waterfall of two streams, it transforms the surrounding area with it. Essential Hot Tub has a wood-look cabinet which appears to be sturdy and therefore requires minimum maintenance. It comes with a tapered heavy duty spa cover with clips for locking it in and which is well insulated to maintain heat. Also, the filters and the heater are made of stainless steel preventing corrosion especially when the water has pH imbalance or from some sanitizers with corrosive chemicals. Along all that there is a multicolor underwater LED light for creating color hues to lift its unique design and to create a relaxing mood. The hot tub has a 2-speed pump which powers it, and with 200-gallon water, it is appropriate for 2-persons but can be crowded to accommodate a 3rd person. Otherwise, the features are for only two people. It has 24 stainless steel back, leg and foot jets which are adjustable to direct it to the area of your choice for soothing hydrotherapy. You can easily reach the equipment by removing the fasteners on the cabinet in case of maintenance. The unit does not need any special power outlet connection but a regular one of 120V/15A which it connects with its GFCI cord. A hot tub is not just a regular water recreation such a swimming pool but a place you get to relax and enjoy hydrotherapy treatment. Therefore the unit of your choice must meet your relaxing and health needs. It is for those reasons that you should be careful of what you pick besides the trendy designs in most of the hot tubs in the market. We know that the size of the hot tub should be one that can hold two people comfortably. However, the form should be your concern here. 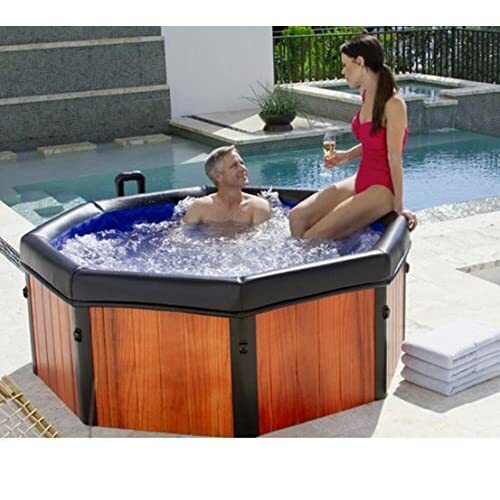 There are different kinds of shapes among the 2-person hot tubs in the market. You will take into consideration the shape of your hot tub depending on where you plan to place it. Hot tubs have vast different materials, and each has a reason for having it. Also, the material used on each hot tub will determine the durability and the kind of aura it will create in its surrounding. These are some of the materials most of the hot tubs in the market pride themselves with. A hot tub with stainless steel shows that it is durable. It is resistant to corrosion, weather extremes and the wear is very low. Most of the modern hot tubs are opting for this material. Equipment made of this material are also durable and of low maintenance. Wood is the traditional material that has been used in constructing hot tubs for ages. There are different kinds of wood that most manufacturers prefer using probably because of the sturdiness and durability. Some of these woods are cedar, cypress, redwood, and teak. Many people prefer going for this kind of material because they want to maintain the tradition. Some prefer it because it has a natural look which blends well with nature and especially when placed in the backyard among flowers and bushes. Due to weather extremes, a hot tub of wood material would require frequent maintenance of sealing and staining to keep it looking sleek and shiny. However, the equipment should be stainless steel due to constant contact with water. Plastic or acrylic hot tubs are the choices of many probably because they are slightly cheaper compared to other material. Since they are easily moldable, they come in different attractive shapes which are an eye-puller. However, the material is not robust to endure weather extremes or mishandling if you have to move it a lot. It is susceptible to chipping, cracking, and color loss especially under extreme sunshine. But, unlike wooden hot tubs, plastic is resistant to decay, and it is easier to clean. Inflatable hot tubs will mostly have high strength polyester and PVC fiber material for durability. These kinds are best for portability. All year round you can then enjoy your hot tub, whether winter or summer. The reason is that you can have it outside on your backyard during summer and move it in your garage, basement or on your patio in winter for an all season hot tub experience. They are the easiest to set up, and anyone can do it. Most come with pumps to inflate air in them. They are also the cheapest among the rest of the hot tubs. But, you wouldn’t expect to have them longer than the other types. Where you choose to install your hot tub will determine the shape and the material. An outdoor hot tub is not limited to shape since it is in the open. If it has an attractive design, the better for your aura and aesthetic. It is easier to install your hot tub outside due to taking advantage of the plumbing and drainage systems. On the other hand, the indoor hot tub installation will need extensive construction due to additional plumbing and drainage systems. Ventilation is also another issue to consider when opting for an indoor hot tub. Again, the size and shape might limit this choice of location. However, with an indoor hot tub, with rain or come sunshine, nothing can stop you from using it. Consider the material of your hot tub equipment. The best is stainless steel which is acid resistant due to water chemicals or unstable pH levels. Again, they are easier to clean. Hot tubs come with a variety of different kinds of features which also determine their prices. But, some basic ones would add value but not the price since they are a must have in the hot tubs. Controls – A hot tub should have controls such as an on and off, temperature, jet pressure, jet direction, and temperature. Some will have these controls at their sitting points while others will have remote controls. Jet Settings – Hot tubs come with different types and different numbers of jets. They will also be located in different areas depending on their purposes. Some of these include back, neck, and shoulder hydrotherapy, feet hydromassage, direction jets to reach different areas of your body, and pulsating jets. Lighting – LED lighting makes a difference to your hot tub due to safety measures especially when using it in the evening or night. Also, some hot tubs have multi-color LED lighting to create an ambiance which helps in relaxation. Waterfalls – More sophisticated hot tubs will have waterfalls to add to hydrotherapy of your shoulder when sitting under it. Mini Tables – Some models include a beverages table where you can rest your drink while enjoying your hydrotherapy. Sound System – Other high tech models will include a music system, radios, and Bluetooth connection. A unit with various safety features would be your best choice. Handrails and steps which will assist in getting inside the hot tub and exiting would be your number one consideration. A unit that is easy to clean should be another point to consider while searching for a hot tub. It includes easy to clean equipment and fittings. Therefore, accessories such filters should be easy to reach. Having a hot tub is a huge investment and therefore should be protected at all cost. Check the warranty and all other policies concerning the purchase of the unit. See that the warranty covers the shell itself and all its plumbing and fittings. Some of the well-known brands can offer a not less than two years warranty on the whole hot tub including all its accessories. Be sure to know what you are getting yourself into before making that final payment step. Even though it is a considerable investment, the cost would matter a lot. Some brands highly price their units for no specific reason where you can get almost the same product with the same features for less. Be wise on money matters. It is worth to find out what other users who have a physical experience with the unit of your choice have to say about it. You will learn a lot from these reviews to decide whether to go for it or stay far from it. The best and safe temperature and especially in the winter is 102 to 104 degrees F. Beyond that can lead to health issues such as dehydration. Since using your hot tub during winter may cost you on your power bills because water will take time to heat up, you should take advantage to drain it before it gets too cold to freeze water in the pipes. Equipment get damaged by frozen water. Also, you can choose this time to change your filters and other necessary maintenance. Invest in a good hot tub cover and a floating thermal blanket which will sit on top of the water to lower costs of power usage during the cold months. This is if you will continue using your hot tub during winter. Otherwise closing it up and taking the time to maintain it would be the best choice. It is not advisable to leave your hot tub empty for long periods. After performing your hot tub maintenance during winter, refill it with water. Do not turn off the power to prevent water from freezing which can do extensive damage to your equipment. When the hot tub is not in use, set the temperature at 5 degrees lower than the temperature you usually use. That way, you take less time to reach the required temperature when you next need to use your hot tub. All the products in this review are the best after extensive research while checking out on the users’ feedback and their features. Therefore you are invited to pick what you prefer best. However, since you would wish to hear the editor’s verdict, it is our pleasure to honor your wish. The best pick is SaluSpa Siena AirJet Inflatable Hot tub which has all the features you would need in a hot tub. Moreover, it is portable, and therefore you can use it in all seasons, indoors or outdoors. Again, it is the best value for the budget. Please share with us and why you have made the selection. We would like to hear your views. Leave your comments here below.